When attempting to understand or explain what the Human Mind is, one of the initial obstacles to be circumvented or overcome was that, since the Mind is a non-physical entity, no-one could either conceive or state with any surety what the Mind might look like. This is not as trite a point as it might seem on the surface, as various studies into the working of the human mind, each in their various ways, suggest that human beings tend to think "in pictures", or, perhaps expressed more scientifically, "in terms of images". Expressed another way, whenever a person thinks of something, a picture or image of that thing is formed and registers in the person's mind; even if at some point in time, the person is the only one who has any conception of what that image looks like. It has been generally accepted by now, that, to understand the Human Mind - let alone its working, some picture or image is needed, to aid in conveying the understanding clearly. The particular picture or image may not necessarily represent what the Mind may actually look like - any more that a diagram in an elementary science textbook actually shows what the atom of any chemical element looks like - it is merely a model. The effectiveness of the model is dependent on how it helps to clarify any particular theory of mind, and make it clearer to the student. Granted there can now be found numerous models for the Mind, the model presented on this page and the supporting explanations are based upon the particular information studied by this Author. Before getting underway, a significant point shall be stipulated here - the visitor is advised not to confuse the Mind with the Brain. In simplest terms, the Brain may be considered the physical organ in and through which the Mind operates, but the Brain and Mind are not one and the same entity. In general terms, the endeavours to understand the working of the Human Mind have generally led to the deduction that two modes of activity are present within the Mind - thereby leading to the model which defines what some have called an Outer Mind, and an Inner Mind. 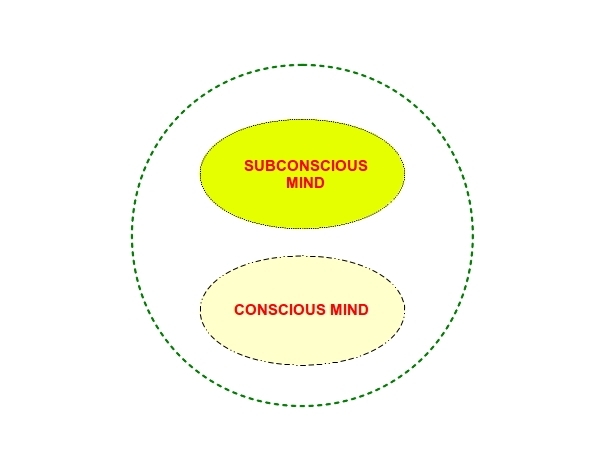 As per the illustration above, the Inner Mind is referred to by many names - the Subjective mind, the Subconscious mind, the Involuntary mind, the Sleeping mind, and others. In similar manner, the Outer Mind is also referred to by many names - the Objective mind, the Conscious mind, the Voluntary mind, the Waking mind, etc. Every person will apply the terms with which they find themselves most comfortable, but it does not really matter which terms are used, so long as this dual nature of the Human Mind is recognized. The adjective, "conscious", has, as one of its meanings, "being aware or cognisant of everything going on around or within one's environment". As it turns out, it is a descriptive term which aptly fits the working of the Conscious Mind, i.e., nothing occurs or transpires regarding the action or actions of the conscious mind, without the individual being aware of it. 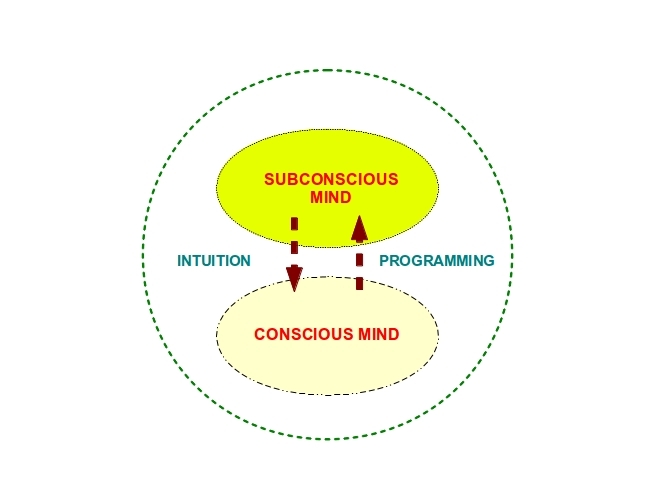 Conversely, the adjective, "subconscious", may be understood to mean, "mental activity existing or operating below or beyond consciousness", i.e., outside of any field of conscious awareness. This, in like manner, aptly describes the working of the Subconscious Mind, which, as has been determined by both reasoning as well as by experiments (primarily in the area of hypnosis), carries on its various functions, while the individual is (for the most part) unaware of its action or actions. 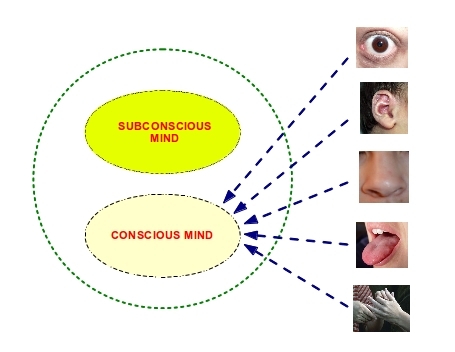 The Conscious Mind may be said to have two primary functions - (a) it is the mechanism through which a person receives information from the objective or physical world, via the physical senses (sight, hearing, smell, taste and touch), and (b) it is the entity from which all voluntary actions which a person performs are initiated. As a simple example, when a person makes a Decision regarding a particular subject, he or she is employing their conscious mind, in order to make the Decision. 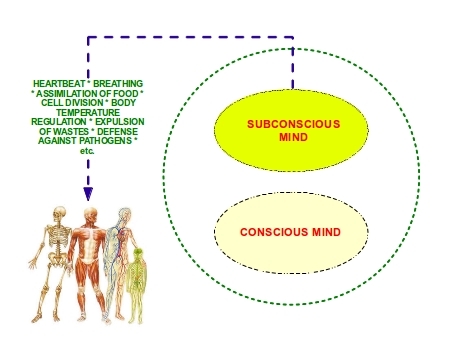 In similar manner, the Subconscious Mind has two primary functions - (a), it is the mechanism which controls all the various processes related to the maintenance and sustaining of the physical body - inclusive of, but not limited to: circulation of the blood, inhalation and exhalation, digestion and assimilation of food, elimination of waste products, regulation of body temperature, etc. - all of which generally progress without any conscious direction by the person. and, as will be touched upon a little further on, (b) it also constitutes the individual's connection with the Original Creative Power (also known as Spirit or Universal Mind), relative to his or her individual world. It has also been determined - both by reasoning and experiments in hypnosis - that there are two modes of interaction that occur between the Conscious Mind and the Subconscious Mind. There exists the action of the conscious mind upon the subconscious mind, by and through which thoughts, ideas, beliefs and opinions are, so-to-say, impressed upon the subconscious mind, so as to effectively become permanently implanted therein. One simple term which aptly describes this mode of interaction is, Programming. And, conversely, there is a mode of interaction, by and through which the subconscious mind conveys impressions to the conscious mind. This mode of interaction may best be defined as the operation of that mental faculty known as Intuition, which shall be explored in further detail, in another section. Now, as was mentioned in the discourse on Universal Mind, the Universal Mind may be considered to act as a template for the formation of the Individual Human Mind, i.e., the Human Mind is actually a miniature reproduction of the Universal Mind. 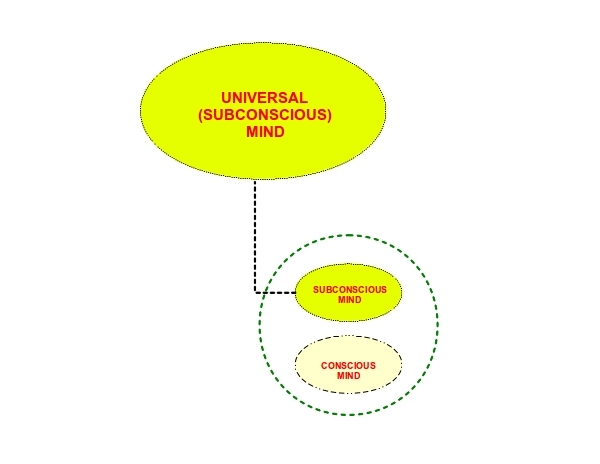 In addition, it can be traced out and deduced that the Universal Mind itself is, so-to-say, 100 per cent subconscious or subjective, i.e., its actions take place outside of a person's field of conscious or objective awareness, in similar manner as the operation of the individual's subconscious mind. A person's field of conscious awareness may be considered to be, essentially, whatsoever registers in his or her conscious mind, via the inputs received from the physical senses, which, by their nature and function, can only deal with that which exists on the plane of the relative (the world governed by Time and Space). Universal Mind, as has been discussed previously, exists - or rather, subsists, independent of Time and Space, so that it needs no objective capabilities or faculties to carry on its work. Hence, the Universal Mind can only be subconscious in nature. And because the Universal Mind is Universal, or a single entity, the Individual Human Mind - or to be more precise, the Individual Subconscious Mind - remains perpetually unified with the Universal Mind. That last point - that the individual subconscious mind is one with the Universal Mind - is of nigh-supreme importance, and its implications will be covered in more length in another section, but for now, it may be enough to indicate that a clear understanding of this point would reveal how and why it is that, as one authority put it, "for each one of us, our beliefs constitute our realities", and a proper apprehension of the Human Mind is one of the essential steps by and through which this understanding is to be gained.